I have a persistence.xml with multiple persistence units, so i manually define the entities that i want to associate with each persistence unit. No problem with that. Now, i have a lot of entities in which i need to have composite keys, so i add an Inner Class to the Entity, that i need a composite key, defining the composite key. 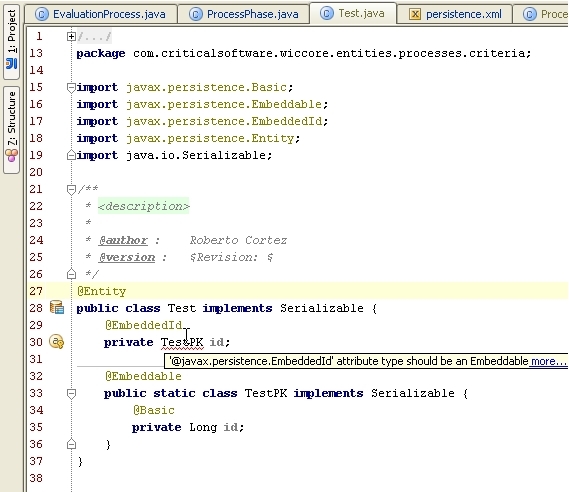 but then hibernate cant find that class, and gives an error mapping the entities, so it does not work. How does your code look and what errors IDEA gives you? persistence unit. No problem with that. errors and the ER Diagram does not show properly those classes. It is something i am doing wrong? Or is actually an IDEA problem? Those inspectiong are really strange since its valid to have an Embeddable PK as an inner class, according to JPA... and i have no problems generating the ddl from those entites... at least hibernate does not complain about it and everything generates fine. Annoying that does not work in IDEA, since i have a persistence unit with a lot of composite keys, and for better organization i would like to have them inside the entities that need them. Also annoying that i cannot use the hql autocomplete because idea wont recognize the embeddable inner classes.